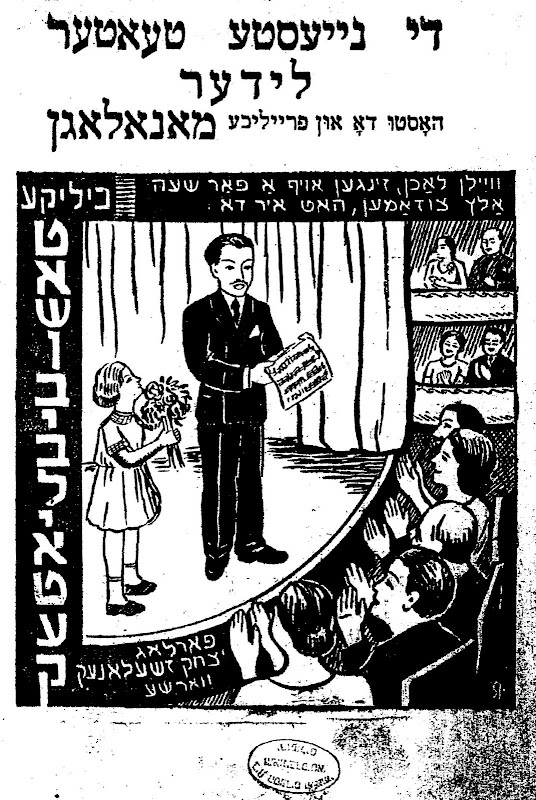 Polish Jewish Cabaret: What happened to I. Zielonek, Warszawa, Pańska 85? What happened to I. Zielonek, Warszawa, Pańska 85? He says "you can get the cheapest songs from me" and he says "if you don't know the melodies, come by Yitzok's place and he'll teach them to you." I bet he did this cover painting himself. I wonder if he made any more books like this one? In somebody else's book, he advertises that he buys and sells Polish and Yiddish books, and that young Jewish poets who want their work published can come to Zielonek every Sunday from 9-12 and 5-9. Maybe he was holding an "open mic."